We’d love your help. 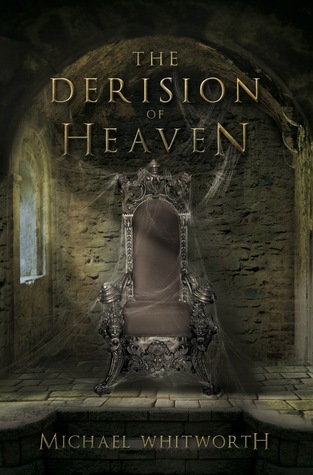 Let us know what’s wrong with this preview of The Derision of Heaven by Michael Whitworth. To ask other readers questions about The Derision of Heaven, please sign up. Every day, it seems the world becomes increasingly hostile to Christianity. Values are being scuttled, faith is scorned, and God’s people are being marginalized. These difficult times pose two questions to Christians: How can we be the “light of the world” in such abject darkness? And how can God still be in control of all things? This book will help you answer these questions. More than a guide to Daniel, “The Derision of Heaven” is an urgent message for the exiled church. As you journey through the story and visions of Daniel, you will be awe-struck by the sovereign rule of God, emboldened to live a life that glorifies him, and encouraged to serve in the eternal Kingdom of Heaven. Michael Whitworth preaches for the church in Bowie, Texas. He is the author of several books, including the award-winning The Epic of God. He also authors the online blog Start2Finish, a reflection of his daily struggle to become more like Jesus. In his spare time, Michael enjoys drinking coffee, watching sports, and spending time with his awesome family and furry golden retriever. Everyday, it is apparent that Christianity is being thrown out the window. That the Lord and all He stands for is diminishing at an ever increasing rate. More importantly, the church's reaction, however subtle is also troubling. Michael Whitworth, the author of The Derision of Heaven is equally shocked, appalled, and saddened at the church's mildly dimming approach to everything that is going on in the world. He takes the book of Daniel and teaches us how if we are as diligent as the characters in that book, than we will reap the benefits of it just as they did. This book is a great reminder of how we the church should be in these troubling times. It is an excellent Bible study! Daniel taught us alot while he was on this earth and we should take full advantage of it. He never cowered under the pressure to bow down to a king other than the one tried and true King. Thats exactly as we should be. Or his friends Shadrach, Meshach, and Abednego---they also faced grave danger when they wouldn't bow down to King Nebeuchadnezzar. But each of these men were delivered by our God when they were willing to die for Him. Their living examples convinces us of so many things; one that if we would give up our lives for His service , he will reward us in so many ways and two everything He says to us--promises us will NOT return void. We serve an awesome God that will give us our hearts desire, if only we trust Him and His word. Above are some of my favorite lines from the book, “The Derision of Heaven” by Michael Whitworth. As an avid reader and one who strives to read at least two books a week, rarely do I come across an author with a skillset as Michael’s. He seamlessly interweaves historical fact, commentaries, and humor in a way that is wonderfully pleasing to read. In fact, it is one of those books that are so good that the reader dreads reaching the end. I couldn’t put it down. “The Derision of Heaven” breaks down the book of Daniel chapter by chapter. At the end of each chapter, Whitworth provides what he calls “talking points”, which allow the reader to think about a modern application of the ancient text. The chapters are well laid out and Whitworth even provides a Q&A with himself at the beginning and supplies the reader with suggestions on how to best use the book in your personal study. The book of Daniel, for all its fame dealing with a lion’s den, can also be one of the most confusing books of the Bible. The last five chapters, in particular, have been the source of more end-of-the-world confusion than possibly any other chapters in Scripture. Yet, Whitworth deals with each chapter in an open, honest fashion. He always communicates clearly as to what is a matter of opinion and what is a Biblical fact, a feat rarely seen in most of today’s theological works. Whitworth also makes it a point to never lose sight of the bigger picture of the chapter. Wow. It took me quite a while to get through this book - not because it's a terrible book (far from it! ), but because the subject matter is so deep and the author so thorough. When I first saw the title, its subtitle, 'A Guide to Daniel', didn't register. I thought the book was about our society's mockery of God. Instead, it's a Bible study guide to the Old Testament book of Daniel, which includes the most challenging prophetical writings. Derision of heaven signifies that while powerful leaders Wow. It took me quite a while to get through this book - not because it's a terrible book (far from it! ), but because the subject matter is so deep and the author so thorough. When I first saw the title, its subtitle, 'A Guide to Daniel', didn't register. I thought the book was about our society's mockery of God. Instead, it's a Bible study guide to the Old Testament book of Daniel, which includes the most challenging prophetical writings. Derision of heaven signifies that while powerful leaders may set themselves up as mighty and god-like, God will not be mocked and these leaders will feel His derision when He brings them to their knees. We can be sure that God has not changed and that He is still in control of our world today, no matter how dark things may seem. Whitworth is a strong writer, whose teaching is supported by Scripture and research. The text is peppered with footnotes, and a bibliography is included at the end for the reader who wants to know more on the subject. The author suggests reading the appropriate chapter of Daniel before reading the matching book chapter, then re-reading the same chapter of Daniel afterward. This is truly necessary in order to get the full benefit of the study. The book deservedly won 'The Christian Writers' Award'. Far from being dry, the author maintains the reader's interest throughout and demonstrates a sense of humour. It's a book I'll need to read more than once for sure, and now that I've been introduced to this author, I'm interested in seeking out his other work as well. i received this book in exchange for an honest review on amazon. i am discovering new religions and Christianity is one of them. i have come to learn a lot about the religion from this book itself. i admit it got a little difficult at few places. for someone who has very little idea about the religion the book may get a little tricky. i somehow liked the description given in the book. i had to ask few questions and do some Google search but it was all worth it. this book is very insightful. would i received this book in exchange for an honest review on amazon. Very good knowledge of biblical history and good current day application. I recommend it highly. This is a fantastic Bible study reference guide to the Old Testament book of Daniel. Whitworth's writing style is both scholarly and engaging. He provides a great deal of historical and cultural context to the story, and makes practical application to current times. Whether you're looking for a scholarly reference book or an inspirational read, "The Derision of Heaven" won't disappoint. A great companion to reading the biblical book of Daniel. Specifically, this book is a call to arms for Christians who are living in an increasingly secular society that all but eliminates God. Excellent. Truly a blessing to read and learn more about Daniel with this book. Eye opening and encouraging. An edifying study of Daniel. A longer review will be at my website at a later date.